Shropshire Council is reviewing its local plan and consulting on development sites up to 2035. You can read my technical response to this stage of the review here. In Ludlow we need to look further ahead than this review is contemplating. I believe we must plan in outline for up to 2065. A fifty-year vision. People might be shocked by the number of homes I am suggesting. They could involve a quarter, even one-third, increase in the size of Ludlow. But take yourself back 50 years to 1970. Ludlow was a lot smaller and it has expanded incoherently since. That’s why we need to plan fifty years ahead for a Ludford Garden Suburb that could have up to 1,800 homes. That’s fewer than 40 new homes a year. Here is my concept plan. As the National Audit Office said on Friday, we live in dangerous times when it comes to planning the future of our cities and towns. On the one hand, the government talks up housebuilding. It wants 300,000 new homes built every year. That’s a good ambition given the long-term failure of governments, councils and developers to build enough homes. The NAO also warns that current planning rules often leads to a free-for-all approach to development. That lead to many people’s opposing development. And it doesn’t lead to housing that works for communities. We must do planning properly. In the old days, and I am going back forty years, people talked of “town and county planning”. Nearly everyone believed that planning should be spatial, zoned and organised. Planners and architects talked of “place shaping” – designing towns and cities to be places for living rather than for commercial profit. But the hopes of ever better planning faded when the planning system was brought under the control of John Prescott’s Office of the Deputy Prime Minister. We witnessed a build at almost all costs approach. That philosophy was enthusiastically picked up by the Coalition Government, which issued a new national planning rulebook called the National Planning Policy Framework (NPPF) in 2012. Place shaping and strategic planning was by this point dead. Despite this, in the last few years there has been a renaissance in designing places around people not around the number of houses. It is led by people who believe in people and places, not a government that worships housing targets. There has been a resurgence in interest in garden cities. The concept has been expanded to garden towns, garden villages and garden suburbs. I can’t think of a single example of truly people-centred design on a large scale in the Shropshire unitary area. We specialise in “Beetle Drive Estates”. You have seen these everywhere. Build an initial estate road – add another off left – then another off right. Mumble regret over the lack of green space. Express ritual remorse on the lack of retail, medical and community facilities. Worship the motor car. Political leaders claim that we have got houses built even but they fail to acknowledge the process was rubbish and that the places we must live in weren’t shaped at all. We have spent too long building housing as though we are heads down in a village hall Beetle Drive. We stick on one limb at a time. The consequences are that people live on mediocre estate roads. They too often must drive because no one thought to sort out the bus routes and footpaths. We need to look at the broader picture. We must accept that we can’t hold back expansion and housing development. Yes, we need to look at the impact on schools. But all housing development pays an infrastructure tax and some of that can be directed to schools. And as Ludlow’s population gets older, we are in danger of school rolls falling. We need to look at the impact on health services. But when more patients register, GPs get more money. The GP practices might need to reorganise, take on more space and staff. But we are not talking about this happening next year. We are talking of a fifty-year project. Sustainable transport will be the key to the success of a garden suburb. On current transport models, a bus link threading through the suburb could reduce traffic pressures on the town centre. By the time the development of the suburb is underway, on demand self-driving electric cars will be part of the mix and along with other transport technologies. Planning must be long term. That’s almost impossible in Ludlow because of the way local democracy is structured. 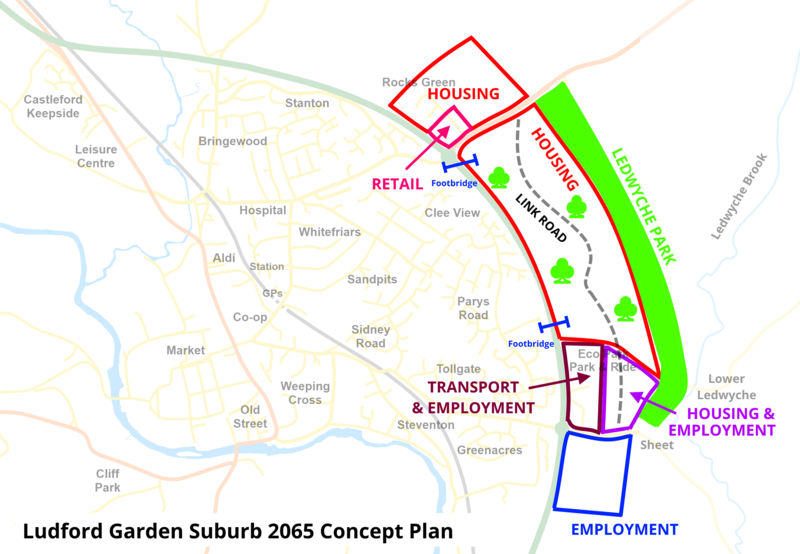 Most development must be in Ludford parish, including my proposal for a garden suburb. But Ludford Parish Council doesn’t want any more development. It has not produced a strategic plan for its future. Ludlow Town Council is inhibited from promoting development in another parish council area and doesn’t think long term either. Local democracy in Ludlow has proved to be as flawed as the national planning system. This is the Ludford Question. The boundaries of Ludlow Town Council should be expanded into Ludford parish to allow effective management of town services, growth and infrastructure, and equalisation of council tax. There is no hope of the Ludford Question being resolved any time soon. That will damage the long-term future of Ludlow. However, my plan will protect Ludford village itself from development. The council has said that a large swathe of land south of the village is suitable for development. Although it won’t be included in the local plan, it could become a target for speculative development if we don’t have a coherent policy for expansion east of the bypass. We cannot preserve Ludlow in aspic. We must always to fight our historic town centre. Without that, Ludlow will not be Ludlow. But we must also plan for a vibrant future for our town. People need places to live and work, to be born and grow old. As I said in the introduction to this article, we can no more hold back housing development than we can hold back the tide. We are faced with a choice. We can spend the next decades objecting to Beetle Drive estates being dumped on us by Shropshire Council and the planning inspectorate. We could try to hold back the tide of housing development. Or we could plan coherently for our long-term future. Planning for the long-term future is not only essential, it’s urgent. We are a decade overdue in getting on with it. Building houses that are affordable is essential but attracting a larger population without consideration to the impact shows incredible lack of insight into what builds communities. It must be linked to infrastructure, and the provision of school places, transport, local health facilities such as our Community Hospital. All of which are under threat from the continued dismantling of all of these through cuts and austerity. Some joined up thinking from Shropshire CC would be most welcome. Your concept plan is sound, but why stretch it out to 2065? 2035 – 2040 would be a perfectly acceptable timescale, and by demonstrating that the town is accepting of well-planned expansion, would hopefully mean planning applications for less-desirable development elsewhere can be refused. A neighbourhood plan – either for an expanded Ludlow or for Ludlow and Ludford – is the way forward in the first instance. The review of parish boundaries can be done separately (I would advocate a modest expansion of Ludlow eastwards, only, to take in the new development sites). I don’t know the details, but I congratulate you on taking a stance that recognises that homes need to be built and the question is how to make that work better n a local context. More madness. I don’t see why there is such a shortage of houses. People don’t visit Ludlow to see vast swathes of poorly built, small, drab, modern square houses with no sense of heritage, they visit for its heritage and what it once was. Why, when the west is seeing supposedly declining birth rates is there such a rate of expansion? We know this will be handled badly, we know it’ll be rows of Stepford Wives like bland housing and likely obscuring some place of natural beauty. So long as its kept well away from anything medieval and doesn’t spoil the feel of the place, that’s about as much as can be hoped for.